1. Heat a medium pot of salted water to boiling on high. Wash and dry the fresh produce. Slice the potatoes into ¼-inch-thick discs. Roughly chop the almonds. Finely chop the tarragon leaves. Peel and mince the garlic, smashing until it resembles a paste. Pit and thinly slice the peach. Peel and mince the shallot to get about 2 tablespoons of minced shallot. Add the shallot to a small bowl along with the cider vinegar. 2. Add the potatoes to the boiling water. Cook 5 to 6 minutes, or until tender when pierced with a fork. Drain and rinse under cool water. 3. While the potatoes cook, make the dressing. Add the garlic paste to the shallot and vinegar. Gradually whisk in about 2 tablespoons of olive oil until combined. Season with salt and pepper to taste. 4. Season the insides of the trout with salt and pepper, then sprinkle the tarragon all over the insides. In a large nonstick pan, heat some olive oil on medium-high until hot. Add the trout to the hot pan, skin side up. Season the skin side with salt and pepper. Cook 3 to 5 minutes per side, or until the skin is crispy on the second side, turning over once. 5. 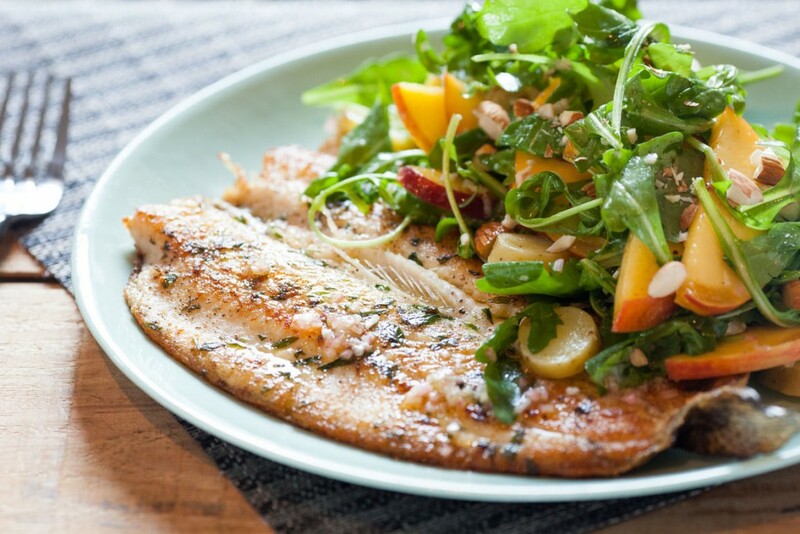 While the fish cooks, in a large bowl, combine the arugula, sliced peach, almonds, and cooked potatoes. Spoon some of the dressing into the salad (you may have extra dressing) and season with salt and pepper. Gently toss to coat. 6. Divide the salad and trout between 2 plates. Spoon some of the remaining dressing over the fish, if you like. Enjoy!